I get so wrapped up in me. In my own fears, desires, thoughts, expectations, etc. My world often revolves entirely around ME. And that's just not ok. It's also just plain stupid. I do have a story and my life does have a purpose, but if I forge ahead, planning my own destiny, making my own way, I will miss out on the story God intended me to have. That's the most important role I've ever been given and I could miss out on it entirely. What beauty and purpose could be brought about if I only paused each day to pray a prayer like this one from Jim Branch. 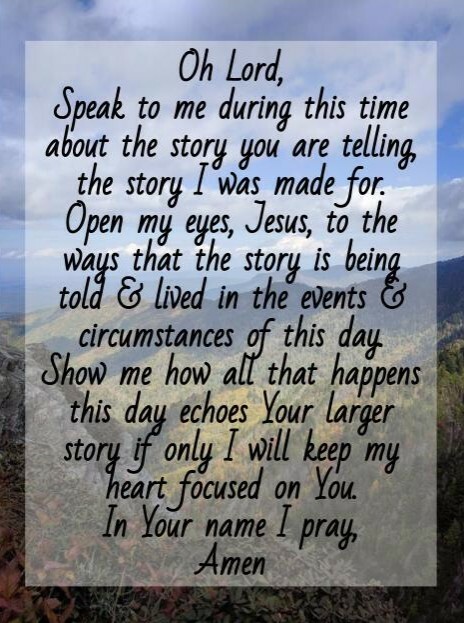 I so desire for my life to be an echo of Christ, to be one story in His great big one that brings Him glory and fulfills His purpose. It's important to pray a prayer like this so get me out of my own head and remember that when I make life all about ME I miss out on HIM.